Markus Kessler (left) and Russ Stoddard, co-founders of Humanista, a new company that helps leaders integrate social purpose into the core of organizations, businesses, and cities. BOISE, Idaho, Oct. 18 /CSRwire/ - The president of Oliver Russell, a purpose-driven creative agency with global clientele, has teamed up with the former CEO of one of Europe’s largest private label cosmetics and personal care manufacturers, to launch Humanista. Humanista is a consulting firm dedicated to transforming business, investing, and cities through social purpose. Humanista focuses on transforming people through social purpose by implementing tangible impacts that can be put into practice every day. Markus Kessler, a former manufacturing CEO, will operate from Munich, Germany. Russ Stoddard, founder of Oliver Russell and author of “Rise Up – How to Build a Socially Conscious Business,” will maintain the company’s United States presence in Boise. Humanista has already begun working with a health tech startup based in Silicon Valley. Kessler currently advises and is an investor in several startup social enterprises that make sustainable packaging as an alternative to plastic and construction materials from textiles, including Ecovision and manaomea GmbH. Working with companies, cities, and investors, Humanista creates actionable plans for a wide variety of organizations. The consulting firm owns and partners with several social enterprise labs, where clients can see firsthand what social purpose and sustainability looks like in action, and the economic opportunity presented by the circular economy. Founded in 2018, Humanista is a social consulting firm that educates companies, cities, and investors on the importance of social purpose, and how to implement social practices to ensure long-term growth and sustainability. 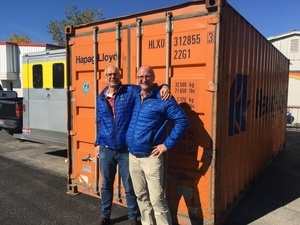 Operating from Boise, ID, USA, and Munich, Bavaria, Germany, Humanista’s global reach connects clients to the world’s most dedicated leaders in social responsibility. Russ is the founder of Boise, Idaho-based Oliver Russell, a certified B Corporation and legal public benefit corporation that builds brands for purpose driven companies. He is a leader in the Certified B Corporation community and author of the Amazon business bestseller, Rise Up: How to Build a Socially Conscious Business. Russ is also a regular featured contributor to Sustainable Brands, Conscious Company Media, and the Forbes Agency Council. Markus jumped overboard from the corporate world after a career highlighted by his leadership as CEO of Europe’s largest private-label manufacturer of detergent/cleaning products, personal care, cosmetics and organic cosmetics. He brings a keen understanding of the unique challenges facing enterprise-level CEOs as they implement sustainability initiatives. Markus is also an active impact investor in several social enterprise startups and a partner in GENIC GmbH.